Q: Who was the 32nd president of the united states? But in many cases, the reference transaction is about much more than simply providing answers, it’s about teaching the patron how to find the answer themselves. A: Well, a quick google search leads us to the Wikipedia list of presidents. Here it lists Franklin D. Roosevelt as the 32nd president, and provides some citations for that information. If you are just curious, the Wikipedia list will be perfect, but if you need to cite this in a paper, you might want to refer to the White House website, which would be more authoritative and provides some good biographical information. Do you need to find more information about Roosevelt? if so, we may have some biographies of him in our collection…. Just like any other learning opportunity, a big part of the whole experience is retention – do the students/patrons remember what you taught them an hour from now, a week from now or a month from now. 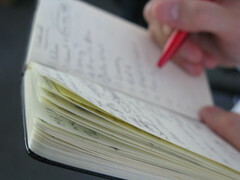 Taking notes is a useful tool in the learning process. CC image courtesy of Flickr user geekcalendar. With that in mind, librarians at my library will be working on some new practices for the Spring semester. Building on the tendency of librarians to jot down search terms or possible databases while working with a patron, we will be making a more concerted effort to write down notes as we answer a question and give those notes to the student when we are done. The idea here is that students will better be able to retain the knowledge they gained if they can refer back to the notes that were taken. We’d like to try and capture information on this student learning, so we are going to try two things. First, we will be using standardized carbonless duplicate note-taking forms. This way the student gets a copy of the notes, and we can retain a copy for future study. Second, we hope to combine this with an assessment of student learning at the reference desk (or at least an assessment of what students think they learned at the reference desk) by asking students to fill out a brief survey asking them what they learned. Hopefully we can be more deliberate in making sure students walk away with a record of the transaction and this will increase the learning that goes on during a reference transaction. We’ve long used a worksheet at the desk that we can hand to them at the close of the interaction. You can <a href="http://guides.newman.baruch.cuny.edu/loader.php?type=d&id=142293"download it if you’re interested. Thanks, Stephen, that’s great. I think we are going to start with something a bit less structured, just because we couldn’t find much agreement amongst ourselves about what we should put on the form. We’ll use it for a while and see how things go. I’m very happy to have other examples to share with my colleagues! Oh wow, the earlier form is a lot different. Thanks for sharing it though, because I think both of these will help us think about how we do this. What kind of response did you get from students and librarians when you started using the form? It doesn’t get consistently used but generally it was very much appreciated by the students that I gave it to. Some of the librarians like to use it in classroom settings as well, pitching it to students as a research worksheet. I tend to use it most in my office during research consultations. I have little sheets of paper by my computer, and I typically write out the search on that & hand it to the student at the end. If I’ve drawn out a Venn diagram, I *always* give that to the student. I’d be really curious to know if / how they refer to these later. I’ll look forward to your blog for insight! What I have found interesting is the fact that this idea of taking notes and giving them to students seems to be a widespread practice, but there is little to no research on how/if this can improve outcomes.